When selecting a respirator, keep in mind that different respirators may be needed for the application of different chemicals or groups of chemicals. Therefore, you must read and follow the pesticide label to insure that you are wearing the right respirator. 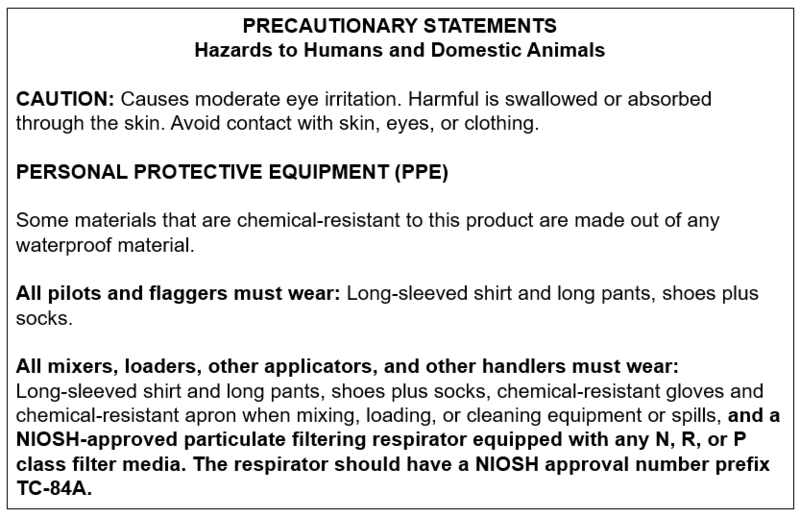 Personal Protective Equipment (PPE) statements, including respirators must appear in the “PRECAUTIONARY STATEMENTS—HAZARDS TO HUMANS AND DOMESTIC ANIMALS” section of the pesticide label (see example below). Read through this entire section of the label as sometimes the same product may require more than one type of respirator depending on the activity. For example, it may be necessary to wear one type of respirator that provides more protection when mixing and loading the pesticide than when applying it. Make a list of the products you or your employees intend to use the next year or growing season. Consult the pesticide labels of each product to determine if a respirator is needed. Example of pesticide label statement (adapted from WPS Respiratory Protection Guide, PERC). Labels can be confusing because respirator terminology has been changed by NIOSH. In 1995, NIOSH took over full responsibility for respirator certifications from the Mine Safety and Health Administration (MSHA). Some pesticide labels continue to use the old terms. Reading the label to determine the type of respirator needed is critical, however, it is suggested that you do not purchase a respirator until you have completed a medical evaluation and fit test.